A few months ago I was talking to a friend, when she looked at me, very confused, and asked me if my eyebrows were purple. I laughed and said they weren’t, and we agreed that it was probably just the light. Usually, I wouldn’t have thought any more of the exchange, but for some reason it got me thinking. 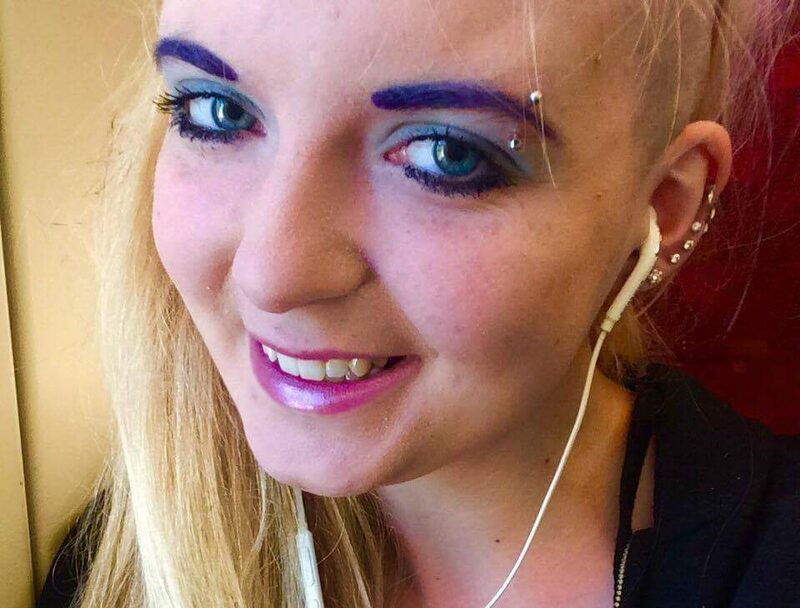 I thought the idea of purple eyebrows was actually kind of cool. The following day, I went to the drugstore and bought myself a purple eyeliner, and I’ve been using it to color in my eyebrows ever since. I’ve been using makeup for around 10 years now, and the whole time, I’ve been using it to try to make myself prettier — in other words, more like the airbrushed girls in magazines. I still don’t think there’s anything wrong with that, but recently I’ve started to see makeup as a creative tool, and have been trying to use it to make myself look interesting, rather than pretty. I think there’s a reason why makeup professionals are called “makeup artists” — because makeup is an art form, with a human face as a canvas. And just like with traditional art, there’s a lot of opportunities to push boundaries. For a lot of girls, makeup has become a routine. We get up every morning and we put on the same foundation, concealer, black eyeliner and mascara that we’ve worn every day for years, just trying to finish quickly so that we can get to class on time. It might be idealistic in the no-sleep, high-pressure world of Drexel to say that the morning routine could be fun, but in my recent experience I’ve found that I definitely feel more happy, energized and ready to face the day when I’ve done something cool and unique for the first time. It’s a really good feeling to leave the house in the morning, confident and excited to show off a striking new look to the world. College is a great time to really experiment with makeup, because there’s no high school dress code and no office professionalism guidelines — just an environment where we can be whoever we want to be. I think that those of us who like wearing makeup should make a New Year’s Resolution to try something new. That could be different color eyebrows, a neon eyeshadow, long sparkly false eyelashes, blue lipstick, glitter cheeks, or even experimenting with more extreme special effects makeup such as leopard print eyelids. Chances are, people will be in awe of your ideas and your confidence, and you’ll get a bunch of compliments from other girls who love what you’ve done. The best thing of all about makeup? It’s temporary. If you do decide to start taking risks, there’s a good chance that at some point, you’ll experiment with something that you don’t quite feel comfortable in or that doesn’t suit you. But just keep a few makeup wipes in your backpack, and you’ll be able to fix it in the bathroom between classes. Makeup is a no-commitment way to try new things with your appearance, since it can easily be changed at any point — what do you have to lose? Personally, my new aesthetic is ‘futuristic space alien’ — teaming the purple eyebrows with blue and silver eyeshadow, sparkly pale pink lips, pale cheeks and an eyebrow piercing. Your new aesthetic can be anything you want it to be. There is so much makeup out there and so many possibilities, so don’t limit yourself to what fits with societal standards of beauty.